To properly train house break your Golden Retriever, you must stick to a routine regarding your crate, and ensure that he doesn’t spend additional time outside of his crate. When he is outside of his crate, you should watch him at all times. If you don’t keep an eye on him when he is outside of the crate and he has an accident inside the house, you can’t blame no one but yourself as you didn’t correct him the second it happened. To help your dog learn the right way to relieve himself, you should always praise him when he goes to the right location. You can crate him at night, then take him out when he wakes up in the morning and show him the correct spot. Give him some time, then praise himself once he starts to go. If you avoid accidents, you should be able to train your Golden without any problems. Once accidents begin to happen though, it can be extremely hard to break the pattern. When you house break your dog, you should never give him any freedom. Getting it right is a lot of work for him, and chances are he’d rather be doing something else. If you are tolerant with him and allow him to make mistakes, you’ll find yourself needing to be a lot more stern to break him of the bad habits that you have tolerated and allowed. If you start when your Golden is young and enforce the rules, he’ll be a happy member of your family in no time at all. When you house break, you should use confinement as much as possible. Confinement basically means that until you have housebroken your Golden Retriever, he isn’t allowed to freely move around the house. You should always keep a watchful eye on him and make sure that if he’s outside the crate – you know where he is at all times and what he is doing. If you happen to take your eyes off of him even for a second, he could easily relieve himself on the floor. Once he starts to go on the floor, it can be really hard to break him of this habit. The smell will be there, and he will smell it the next time he is in that area. Each time he smells it, he will instantly go to the bathroom in that same area. The best way to prevent this from happening is to watch him at all times and ensure that he only goes in the area you have for him. To housebreak your Golden Retriever, you should also allow him a way outside. Normally, a doggy door is the best way to do this, as your puppy can go outside and relieve himself when the time comes, without disturbing you. You should also use puppy pads or a litter box inside as well, so that he always has somewhere to relive himself. During times when he can’t make it outside, he needs somewhere else that he can go. Housebreaking your Golden Retriever can take you some time, although it will be well worth it once your Golden is properly trained. He’ll be an essential member of your family, and not use the bathroom anywhere he takes a notion. He will only relieve himself outside or in an area that you have trained him. 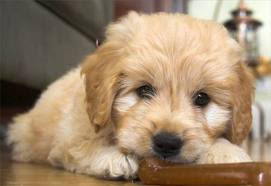 Golden Retriever’s need interaction with people, and if you are going to keep them inside – you’ll need to ensure that they have been properly house broken. Welcome to The Top Dog Blog!